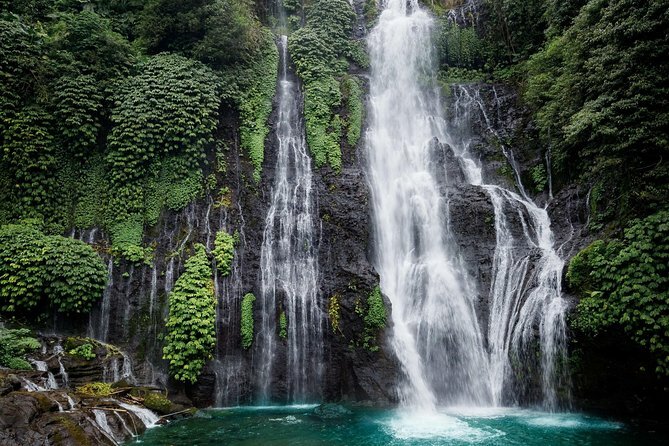 Munduk and Melanting waterfalls are among Bali’s most scenic, located within Bali’s lush and forested central-northern highland region. The falls are a highlight feature of the namesake village of Munduk in Buleleng, North Bali. Cool mists and the rushing sound of water greet you upon reaching the Munduk waterfall. Here you can wade into the rocky pool for a cold dip. Banyumala Twin Waterfalls is absolutely one of the most beautiful waterfalls in Bali. You can see lots of tropical plants are grown freely everywhere, right under the waterfall there is a naturally formed pool that has become a favourite spot for visitors to swim and bathe filled with clear water, so you can see the bottom of the pool. This pool is 20 meters wide so many people can fit in it, and we advise to be careful If you decide to swim, the deepest part of the pool is approximately 2 meters deep. At Banyumala, guaranteed you will get a lot of interesting photos captured. Gitgit Waterfall is a waterfall located on the highest hill in the north of Bali. The area around Gitgit Waterfall has many other waterfalls which are absolutely stunning. As well as being one of Bali’s premium attractions, Gitgit Waterfall is often used as a location for photographers due to its stunning backdrop. Newly developed as a tourist attraction in early 2018, the falls here are among the best on Bali. It’s about a 20-minute walk from the car park, a 500m trail, which is paved only with concrete stones and logs, winds through a village and coffee plantation. You'll eventually arrive at a large sign, where the path diverges to four separate cascades. Touches like colorful shrubs, bamboo huts and bridges make them especially Insta-worthy.